In Rise of the Planet of the Apes, James Franco’s character was trying to find the cure for Alzheimer’s by testing vaccines on chimps, which would then exhibit increased intelligence. After finding one that worked on his father, he discovered years down the road that the human body built up an immunity to it, so he went back to the drawing board to find a new cure. The company he worked for rushed trials too soon and when one technician was exposed to it accidentally, he was infected with by what provided to be a deadly, incurable, fast-acting virus. It took his life, but not before he unintentionally spread it to others. One of those victims happened to be a pilot who then further spread the lethal flu virus. The film centered around an ape named Caesar, who had been born from a mother who had been tested on with the initial vaccine and his growth gave him hyper intelligence and even human-like traits. By the end of the story, he frees many other apes after exposing them to the same virus that is killing the humans, and it causes those apes to mature similarly to Caesar. He then leads the animals into the red woods forest in San Francisco where they build their home. Dawn opens almost a decade later after their colony had continued to grow and flourish. Those who casually watch these movies or have a very limited knowledge of the previous films from the 70s might find the science fiction elements of this movie silly or pretty far out there. But director Matt Reeves handles Dawn incredibly delicately, reaching for a mostly serious and dramatic tone instead of the campiness of the original series of films. 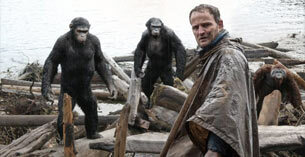 The 2011 film, directed by Rupert Wyatt, was also mostly serious, focusing on the relationship between Franco’s character and Caesar the ape. It then showed humanity’s effect on the apes and how the way a certain group of humans mistreat the apes leads to their rebellion and bitterness towards humans. This becomes a very thick theme in Dawn. 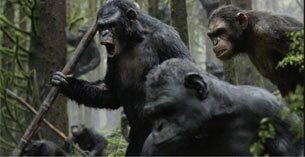 Koba, an ape who had been severely tested on in Rise is especially angry towards and distrusting of all human beings. Caesar, however, recalls his compassionate friends and knows that not all of them are bad, but he just wants his kind to be left alone. When we meet the San Francisco human colony in Dawn, the city is in utter ruins, even overgrown with vines and weeds (which seems a bit quick though, right? ), and the survivors who appear immune to the disease that wiped out most of the world are in need of finding a new source of power for their colony. This leads them into the woods to investigate a dam that is no longer in operation in hopes of restoring it… but it only sparks trouble. Some will be surprised to see the movie open full-on from the perspective of the apes and their own colony in the woods (I love that the shape of the window at Caesar’s original home has become a symbol for their ape family), and for the first 15 or 20 minutes of the movie, it’s subtitled like a foreign film as we watch the apes communicate using sign language. When the humans do enter the picture, we get an interesting blend of signing and actually hearing the apes speak English out loud (albeit minimally), keeping in line with the original films. At first, there’s a little bit of a Jurassic Park: Lost World (or JP III even) feel and then kind of an I Am Legend vibe, given the wild forest, post-apocalyptic, almost monster-movie feel with the ape versus struggling human aspects. But Reeves and the script writers keep the core human character group small (like with Rise) and focus on their own stories of loss and survival following the unseen “fight” with the all-consuming virus. And that even carries a bit of a Fallen Skies feel. Jason Clarke’s Malcom is paralleled with Caesar as they both exhibit compassion and understanding for each other’s races. At the same time, Koba and Kirk Acevedo’s jumpy, trigger-happy Carver represent the violence that’s born from fear of the other’s kind. But before you think these movies are made to demonize our race for being unsympathetic to nature and animals, this sequel doesn’t hesitate to portray the animals as villains or catalysts for violence too. What makes Dawn of the Planet of the Apes work so well is a strong script, directing from Reeves, and incredible performances from actors Andy Serkis and Toby Kebbell as apes Caesar and Koba, respectively. Their performances were accomplished through motion capture suits and computer generated apes, and Serkis and Kebbell really bring them to life. If it weren’t for Serkis putting so much intensity into their roles, the movie wouldn’t have worked nearly as well as it does. (The scenes where Caesar revisits his old San Francisco home are truly moving.) Clarke is slightly bland as Malcom, but he’s likeable enough and he works well for a parallel to Caesar. Gary Oldman is a joy to see in a movie like this one, playing Dreyfus, the leader of the human colony with a military background. Oldman is an incredible actor, and although he’s on screen for far too short of time here, he adds an extra sense of validity to the film. One scene where he recalls photos from the pre-viral infection days is heart wrenchingly perfect due to Oldman’s intensity as an actor. Keri Russell is good as Ellie, but she doesn’t add a whole lot to the film. Still, she has a very real sensibility about her to add a realistic feel to the story. The only drawbacks to the film may be the semi predictable nature of the plot, but the attention to detail and the care taken for the story, characters and apes makes for a strong end product. Violence is the main caution to give the movie, however. In particular, there’s a scene where an ape suddenly shoots two humans with an automatic rifle that is a bit brutal, although nothing too graphic is shown. But it’s nothing compared to when the apes charge the humans on horseback and a major shootout ensues, with apes being shot up and blown up left and right. Some of the impacts and animals falling from their horses are shown in slow motion which adds to the intensity of the scene. It’s not very graphic or bloody, but the images of extreme machine gun fire aimed at the apes and horses, and the animals attacking the humans back, is definitely an intense sequence. Some other violence is present, including the apes battling each other, but it’s not nearly as brutal as the aforementioned scene. There’s some blood, but most of it is sparse and not heavy. When Caesar fights one ape briefly, we see the other ape with some blood on its face. Later, we see blood on an ape’s chest after it’s shot and a gash in the side of another during a fight. A young ape receives gashes on its chest from an encounter with a bear in the first few minutes of the movie, and those gashes remain with the character throughout the movie. Finally, there’s some profanity, with Gary Oldman using the “F” word near the climax of the film, and a handful of other profanity (including a couple uses of blasphemy) as well. It’s all unnecessary too, and it certainly wouldn’t have been missed if it had been left out entirely. Alcohol/Drugs: We see two men sharing a bottle of alcohol while shooting rifles. They jokingly try to share it with Koba, who takes the bottle from them and drinks from it; We see people with beer bottles drinking and partying in celebration. Blood/Gore: A bear attacks an ape and we see some bloody gashes on their body; An ape shoots two men with an automatic rifle and we see from behind them with some blood on the face of one of them slumped backward; Two apes fight and one of them takes the other and repeatedly beats on them and slams their body into the ground. We then see that ape has some blood sprayed on their face; An ape is shot and we see some blood on their fur; We see more views of an ape who was shot that has some blood on their fur around the wound; During a fight, an ape receives a gash in its side and we see the bloody wound on them throughout the scene; After some rubble collapses on some humans in a dam explosion, we see a little bit of blood on a man’s leg as it’s being bandaged up; Dreyfus looks over and sees a fallen comrade with some blood on their head and their eyes frozen open. 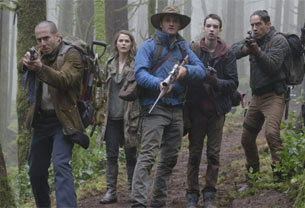 Violence: The opening scene shows apes hunting a herd of deer. A bear then attacks them but they spear and kill it; A man is surprised by the apes and shoots one out of fear; Apes surround a human and push him to the ground while he talks to the head ape; We see animal bones near the apes’ home; The humans stock up on weapons in case they need to defend themselves against the apes. We see a few scenes where a couple men are practicing firing their weapons at targets; An ape shoots another ape and we see the victim fall to the ground; An ape pulls a man out of his vehicle and we see it pounding on the man (off camera), presumably killing him; An ape shoots two men with an automatic rifle. It’s done suddenly and violently; An explosion in a dam collapses part of it but the apes help dig out humans trapped inside; Apes take the weapons away from the humans and we see them destroying them. 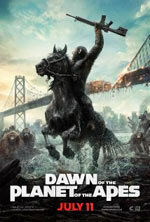 They soon find that one of them still hid a gun and the apes take it away and throw it into the nearby lake; A human smacks away a baby ape; An ape sets fire to their own village to frame the humans; The apes raid the human armory and attack the human colony on horseback while firing large automatic rifles. It’s a long and intense sequence where many horses and apes are shot and the humans are attacked, with apes overrunning their compound. We see apes falling after being shot in slow motion. There are large explosions from cars blowing up and grenades going off with apes being thrown into the air. We see the humans firing large guns back at the apes as they attack; The apes then take over, caging the humans and anyone sympathetic to them; Apes attack a bus full of other apes and the apes inside rock it and it falls on top of the ones on the outside; We see apes chasing humans in the street, capturing them and dragging them away; We see a large explosion consume a few people, causing a structure to collapse. We see debris and apes falling in the process; Two apes fight to the death in a violent battle; An ape throws another ape off a balcony and we hear the dramatic thud of it hitting the ground (and dying); Another ape falls to its death; and other action violence.